Lately I've been sharing a lot of sad and infuriating stories both on this blog and on my social media channels. The truth is that the world is full of injustices. And it doesn't help anything when we bury our heads in the sand and pretend they don't exist. But, the world is also full of love and kindness. It's full of people with amazing stories. It's full of people working to make this planet a better place. And sometimes we need to shine the light on those stories too. So I posted a challenge on Facebook. Do you have a story you think will make people smile? Link it on the Mondays with Mac Facebook Page! I will post the stories for voting on Monday June 17th. 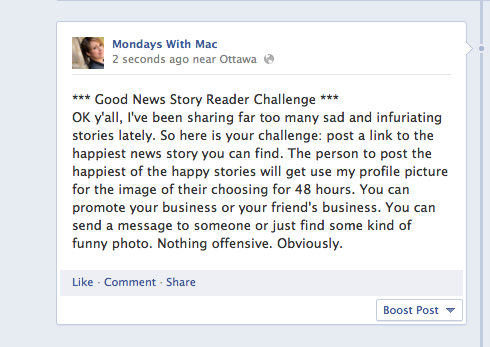 The person who posts the happiest, most-feel-goody, story will get access to my profile picture for 48 hours. You can advertise your business, your friend's self-published novel, a charity you feel strongly about, or a picture of a dog cuddling a squirrel. It's your call! Get FREE SHIPPING on all your I See Me orders through June 24th with coupon code SHIPPING at checkout! Full disclosure: If you click on the above link and make a purchase a small amount of money will come to me. This is a great way for you to support this site.